I have a wonderful pulled pork recipe that I make in my Dutch oven. I always make enough to do great things with the leftovers and when I say great things I am not exaggerating. 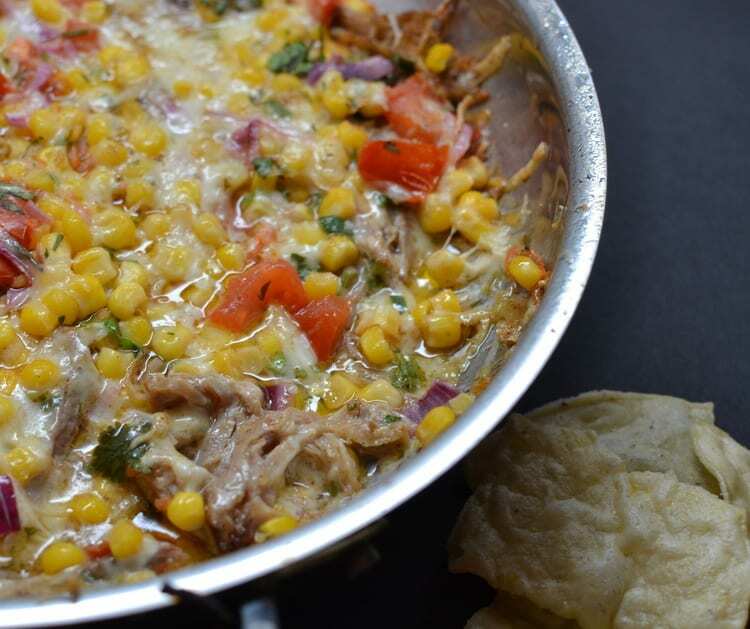 Pulled pork goes great with cheese, peppers, tomatoes, corn salsa & chips. Did I say cheese? Of course I think cheese goes great with everything. Don’t you? Look at all that delish melting cheese and seasoned pork positioned just right to go into my daughters mouth. I am jealous! Where’s my chip! Better yet where are my chips….notice the plural tense. Heat 2 tablespoons olive oil in Dutch oven over medium heat and brown pork shoulder on all side. Remove from heat, place on plate and set aside. In same dutch oven heat 1 tablespoon olive oil over medium high heat. Add onions and cook for 10 minutes turning once or twice. Add garlic and cook for an additional 2 minutes. Add brandy and cook until reduced by half approximately 1 minute. Add Worcestershire sauce, soy sauce, chicken broth and liquid smoke. Stir to combine. Remove from heat. Add pork shoulder, cover and cook for 4-5 hours. Pork will pull apart very easily when forked. Allow to cool for 10 minutes then use two forks to shred the pork. 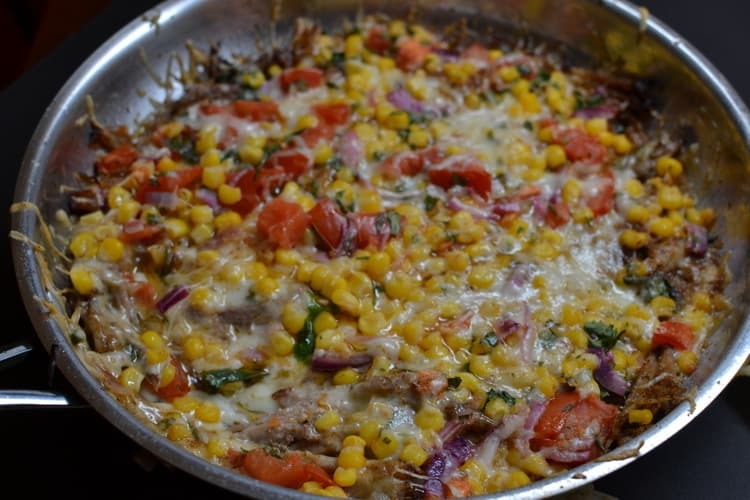 Combine corn, tomato, red onion, serrano pepper, 2 tablespoons cilantro and lime juice. Allow to sit for 15 minutes. Grease 10 inch ovenproof skillet. Add 1 cup Monterey Jack Cheese and 1/2 cup cheddar. 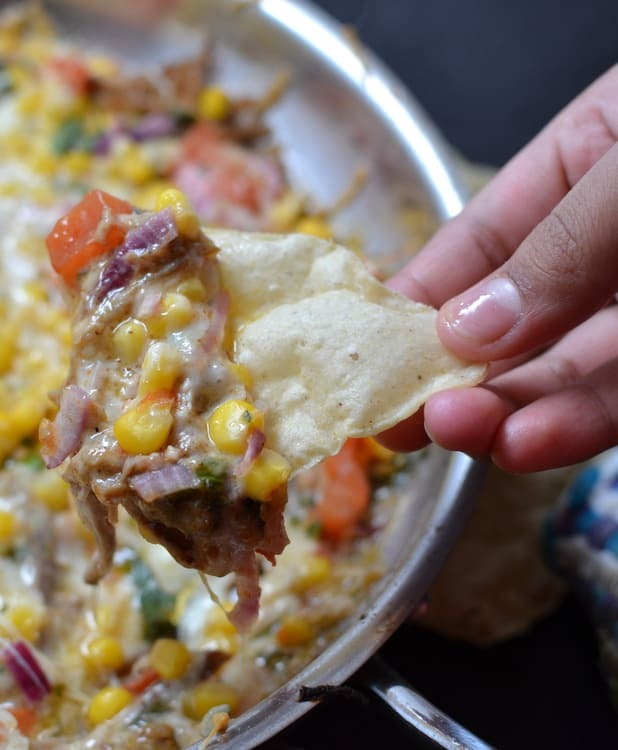 Layer with 1 cup pulled pork. Add 1 cup Monterey Jack Cheese and 1/2 cup cheddar. Layer with 1-2 cups pulled pork. Top with the rest of the Monterey Jack Cheese, chili powder, cumin and salsa. Bake for 5-10 minutes or until hot and completely melted. Start checking on it after 5 minutes. This makes a full pork shoulder which is enough for another meal or two. You could make pulled pork sandwiches topped with coleslaw or pulled pork pizza.